Update, October 9: The Quad Launcher is coming to Fortnite. The Quad Launcher is finally coming to Fortnite. 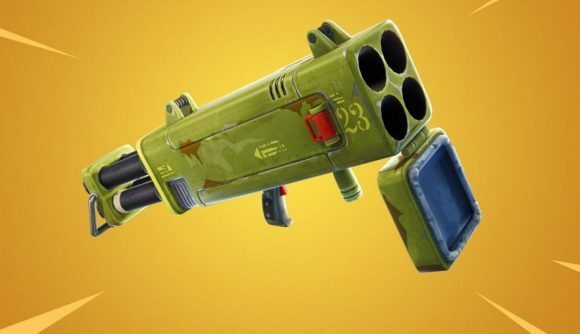 The four-chamber rocket launcher was datamined towards the beginning of Season 5, but has just shown up in the ‘Coming Soon’ section that appears when you load into the game. What I’d guess that will mean is that the Quad Launcher will have a ‘magazine’ containing four rockets. Normally, you need to reload a Rocket Launcher between each shot, but here, you’ll be able to fire off four explosives in quick succession. The caveat will likely be a very long reload time, but I think that’s a fair payoff, as the Quad Launcher will likely be very difficult to play around in close-quarters engagements. The datamines that originally uncovered the Quad Launcher also showed off a few other items that were set to make their way to Fortnite. Two of those three items have already shown up – the Shockwave Grenade and Suppressed Assault Rifle are both live in the game at the moment. The only weapon from that datamine that hasn’t made it to Battle Royale so far is a Flamethrower. Now that the majority of weapons from that particular set of files have made their way to the game, it might not be too long until we get to start roasting our opponents. I’d assume that the Quad Launcher will show up in the game’s next update, so expect it in the next week or so. Until then, here’s where to find the Fortnite Streetlight Spotlights – you’ll need to get your boogie on if you want to complete the Season 6 Battle Pass challenges.